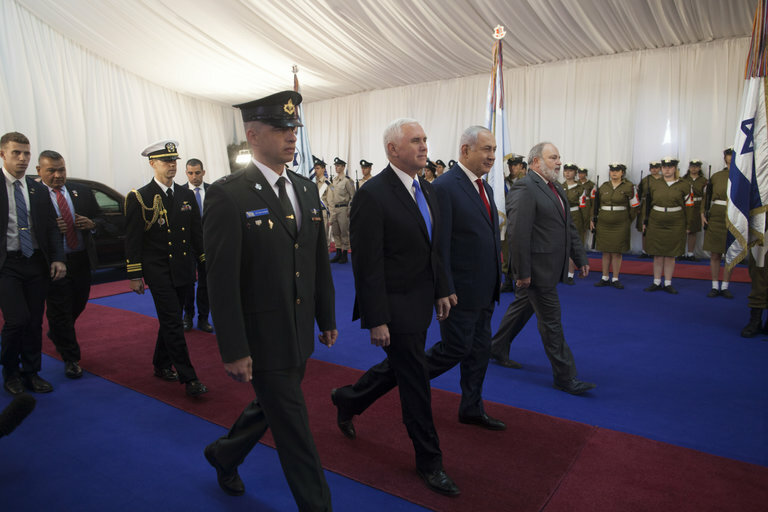 Mike Pence Says U.S. Embassy Will Open in Jerusalem Next Year – Coercion Code – "Dark Times are upon us"
Arab lawmakers rose to their feet at the start of Mr. Pence’s speech in the Israeli Parliament and held up signs reading “Jerusalem is the capital of Palestine.” Ushers pulled down the signs and escorted them out of the room, to the applause of others in the hall. In recognizing Jerusalem as Israel’s capital, Mr. Trump endorsed the Israeli position, but has said that the embassy’s move to Jerusalem from Tel Aviv should not hamper peace talks. He says he is working on a “deal of the century” that will resolve the conflict, though few details have been released. Mr. Trump has also threatened to shutter an office of the Palestine Liberation Organization in Washington and cut American donations to the United Nations agency that provides services for Palestinian refugees. In his speech to the Parliament, Mr. Pence spoke in glowing terms of the long alliance between the United States and Israel, framing it as part of an epic battle. “We stand with Israel because we believe in right over wrong, in good over evil, and in liberty over tyranny,” Mr. Pence said. Mr. Pence, an evangelical Christian, dotted his address with biblical references and spoke of the Jewish connection to Jerusalem in historical and religious terms. Arab members of Israel’s Parliament orchestrated a collective demonstration against the U.S. Embassy move as Vice President Mike Pence spoke in Jerusalem on Monday. By THE ASSOCIATED PRESS. Photo by Pool photo by Ariel Schalit. “The United States has chosen fact over fiction, and fact is the only true foundation for a just and lasting peace,” he said. “His message to the rest of the world is clear: violate international law & resolutions and the US will reward you,” he said, according to his office’s Twitter account. Dr. Saeb Erekat: The messianic discourse of Pence is a gift to extremists & has proven that the US Administration is part of the problem rather than the solution. His message to the rest of the world is clear: violate international law & resolutions and the US will reward you. Mr. Pence has spoken of protecting Christian minorities in the Middle East, but he has been widely shunned by those same Christians for his embrace of the Israeli position on Jerusalem. Next Next post: Who’s driving Self Driving Cars?